A service is a application component that run in the background to perform long running operation without needing to interact with the user. Service can run in the background indefinitely ,even if component that started the service is destroyed. A service run in the main thread of the application instance.It does’t create its own thread. Service always performing a single operation and stop itself one intended task is completed. 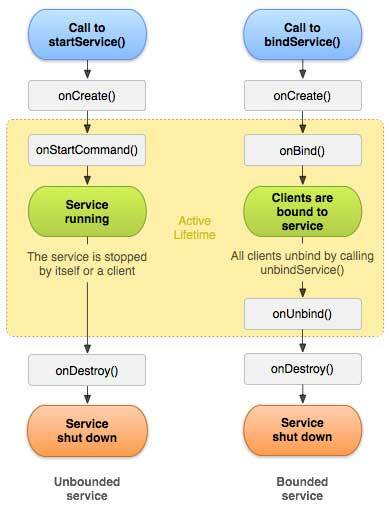 Started service-A service is started when the application is (like Activity) start it by calling startService() method.It is stopped by stopService() method.The service can stop itself by calling the stopSelf() method. Bound service-A service is bound when an application component bind to its by calling bindService() method. The client can unbind the service by calling the unBindService() method. This metod is called when another component wants to bind with the service by calling bindService(). This method is called when the all clients have disconnected from a particular interface. This method is called while the service is first created.Here all the service initialization is done.This method is never called again. The system call this method when the service is no longer used and being destroyed. A service must be stopped itself by calling stopSelf() method onece it is finish execuation. You can also stopped a service yourself by calling stopService() method. stopService() method will call onDestroy() callback in your service.